Hi everyone, Assistant Editor JK here! Feels so strange to have an episode without a Hawaiian title, doesn’t it? Well this is certainly a one-off, and that makes it special and I am so honored to be recapping this ep for Westy’s Champ Box! The episode begins with a funeral… for whom we never learn, do we? Well, we all love a parade, but an angry man with plastic hands is marching through the cemetary and he appears to be up to no good. And indeed he is not, his robo-hands assemble a pretty nasty looking sniper rifle and pop the motorcycle cop is a goner and the parade is over! So now we know – for certain – that WordArt existed in 1973 (it didn’t) but Impact font obviously did — and this is the cat macro font people! Truly a timeless piece of type-craft. Such a legacy. 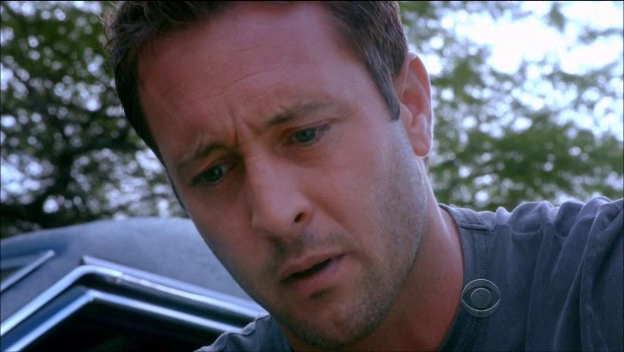 McGarrett arrives on the scene and Danny informs him that the victim is old Ben Keoki. Unfortunately, Obi-wan Keoki didn’t use his Jedi powers to dodge this bullet and crap now Steve has to pull sadface and call Obi-wan his Uncle Ben and reminisce about the times the old guy would fix him up a side of rice and teach him how with great power comes great responsibility. Chin & Kono find the bullet casing with Keoki’s name on it. Guess we’re looking for someone who knows the names of the people he wants to kill. I want to start with the person who thought it was a good idea to keep all the credits in 50-point bright yellow font. The camera is swinging around like it’s been drinking and I kinda wish I had been as well. Oops. Steve interviews Keoki’s partner Ookala – and wasn’t that a fun name to hear pronounced 15 different ways by the various cast members? But he doesn’t learn much besides the fact that Keoki was a great guy who didn’t waste money on driving lessons, instead scamming free ones off Poppa McG back in the day. More helpful is Chin Ho, who has diagrammed the snipers’ shot, leading Steve to surmise that the killer will kill again. So again we visit our killer, but he’s not killing anyone! He’s making a warm beverage on this frosty Hawaiian morning… or demonstrating how his plastic hands won’t melt when exposed to extreme heat. Viewers choice! I love your font McNerding! Even though the words ‘cat macro font’ are totally meaningless to me! It WAS the camera! I thought I just had a dodgy internet connection. If Keoki wanted to be a cop that badly, why didn’t he just – oh, I don’t know – LEARN TO DRIVE??? Seems like it would be less effort in the long run. The learning to drive thing totally had me WTFing? and then I realised that there were more WTF? moments to come. Also, awesome name aside, I could hardly understand what Ookala was saying. I wish he’d opened his mouth more when was speaking. Excellent recap, Steph, by the way :). The learning to drive thing makes me skeered for the qualifications of the rest of the HPD…. That was so weird I had to set it aside. Biggest WTF ever. maybe thats why the get killered alot, they not so smart. I was too busy looking at his googly-eyes – he sorta looked like he was blind or something. That HPD, they’re really something! Hi StephJ, enjoying the recap. That font took me back. I used to watch the original H 50 with my Dad on a Sunday night. I used to like that Danny too. What is it with me and second- in-commands? I’d really like to watch the original now. Anyone know how I can in the UK? And as far as seeing the old eps, I would try…. Arrr Matey…. unless they are selling/renting the DVDs programmed for your region? I’ve been trying Aarr Matey, might have to go legal. I was v v young (a baby really) when the original was on the air but I remember that font like it was yesterday. The camera movement, the music and the close up of the actors’ faces is also reminiscent of the original too!! I LOVE Show so much right now for doing such an incredible job of remaking this classic ep!!! I actually saw a tweet that said “Hey, I remember them doing something really similar in the original!” … LOL. I mean… whoever that was is ON TWITTER so it’s not like they live under a rock somewhere!!! Third pic down, by his posture and expression on his face, Steve is obviously keeping a very big secret, and very pleased with it. I volunteer to sit on his lap and help him out with whatever he needs!!! His thighs look massively manly and massive!! JFC his hands look HUUUUUGE in that pic! Vincent’s place was cleaner……that flat was fantastically disgusting. I’m speaking foreign again!!! Damnit!!! I barely have a grasp on american…..now look what you lot did to me….bloody hell. Lol only a true geek would know you’ve just mixed movies here. 😉 Noted.